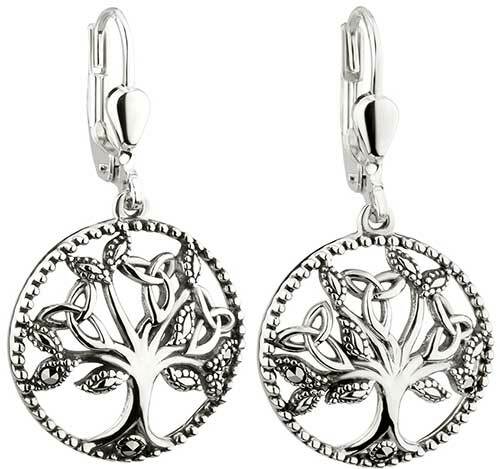 Sterling Silver Tree of Life earrings are studded with marcasite stones and are enhanced with several Trinity knots. The buds of these sterling silver Tree of Life earrings feature embossed borders with several of the buds set with a marcasite stone. The marcasite stone Tree of Life earrings are further enhanced with a total of 6 Celtic Trinity knots along with embossed borders and a marcasite stone at the base of the trunks. The Tree of Life earrings have a dapped or dome shape design that measures 5/8" wide x 1 1/4" tall, to the top of the latching Eurowires. These dangle earrings are gift boxed with Tree of Life and Celtic knot history cards, complements of The Irish Gift House. 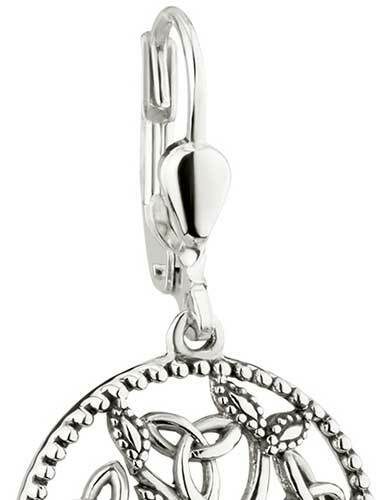 The Celtic earrings are made by Solvar Jewelry in Dublin, Ireland. 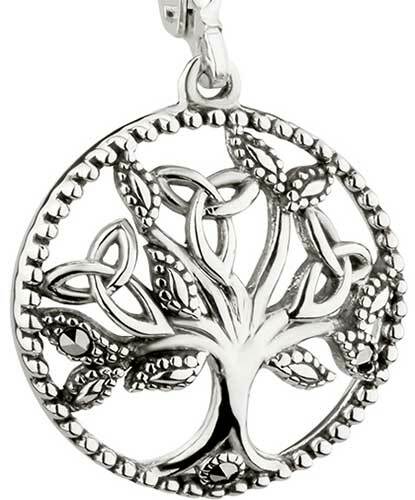 Sterling Silver Tree of Life necklace is studded with marcasite stones and is enhanced with several Trinity knots.